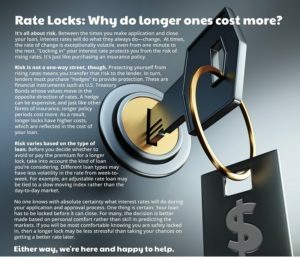 Rate Locks: Why do longer ones cost more? It’s all about risk. Between the times you make application and close your Home loan, interest rates will do what they always do – change. At times, the rate of change is exceptionally volatile, even from one minute to the next. “Locking in” your interest rate protects you from the risk of rising mortgage rates. It’s just like purchasing an insurance policy. The risk is not a one-way street, though. Protecting yourself from rising mortgage rates means you transfer that risk to the lender. In turn, lenders must purchase “hedges” to provide protection. These are financial instruments such as U.S. Treasury Bonds whose values move in the opposite direction of rates. A hedge can be expensive, and just like other forms of insurance, longer policy periods cost more. As a result, longer locks have a higher cost, which they are reflected in the cost of your loan. Risk varies based on the type of loan. Before you decide whether to avoid or pay the premium for a longer Mortgage rate lock, take into account the kind of loans you’re considering. Different loan types may have less volatility in the rate from week-to-week. For example, an adjustable rate loan may be tied to a slow moving index rather than the day-to-day market. No one knows with absolute certainty what interest rates will do during your application and approval process. One thing is certain: Your loan has to be locked before it can close. For many, the decision is better made based on personal comfort rather than skill in predicting the markets. If you will be most comfortable knowing you are safely locked in, then a longer lock may be less stressful than taking your chances on getting a better rate later. Either way, we’re here and Our Mortgage loan officers are happy help.